Since the 39th Parliament, the Harper government has tried and failed to pass bills that would limit the tenure of Senators to somewhere between 8 and 12 years and provide a legislative framework for provincial senatorial elections along the lines of Alberta’s Senatorial Selection Act that would form the basis of the governor general’s appointment of new senators on the advice of the prime minister. As LegisInfo shows, the Harper government introduced these two bills fully seven times previously in the 39th and 40th Parliaments. After forming a majority government in the 41st Parliament, the Harper government then introduced these two bills as one omnibus bill, Bill C-7, The Senate Reform Act. Given that the Conservatives have finally achieved a majority in the Senate, the bill will probably pass. I shall examine the two parts of Bill C-7 and analyze their implications on both the crown prerogative and bicameralism (and therefore also to responsible government). I consider both parts of the omnibus bill constitutional in principle because they fall within Section 44 of the Constitution Act, 1982, the amending formula by which the Parliament of Canada alone may amend the parts of the constitution that fall exclusively within its jurisdiction. However, the current language of this bill presents several problems, and I have some reservations in particular about the establishment of provincial senatorial elections. In addition, section 4 of this legislation would delineate between PM Harper’s nominees and all the other senators. This provision would grandfather in all the senators appointed before 14 October 2008 such that they face no term limits and would retire at the mandatory retirement age of 75, but it would impose the limit of nine years on the senators whom Harper nominated after the coming into force of this legislation. (It would not make their term limit of these senators retroactive to 14 October 2008). This provision could pose some constitutional difficulties. The Legislative Assembly of Alberta passed the Senatorial Selection Act in the 1980s, and the province held its first senatorial election on 16 October 1989. Stanley Waters won that election under the Reform Party banner, and PM Mulroney agreed to nominate him to the Senate of Canada in 1990 because of his commitment to the impending Charlottetown Accord, which would have turned the Senate into an elective chamber. Contrary to all the short-sighted media coverage at the time, PM Harper nominated Bert Brown on 10 July 2007 as the second democratically-selected senator. Bill C-7 used the Albertan legislation as a model and encourages, though does not require, all the other provinces and territories to follow suit. 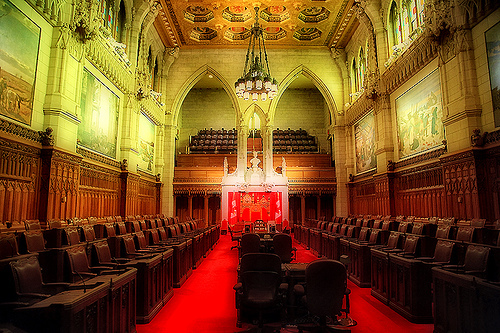 This part of the bill attempts to circumvent the normal process of constitutional amendment, because converting the Senate of Canada into a proper elective chamber would require the 7/50 amending formula – which almost certainly would not happen under the current political climate. The Harper government’s current proposals risks the creation of a peculiar type of deadlock rooted not in the written constitution and inherent bicameral institutional arrangement, but in the form of the new conventions on the use of the prime minister’s prerogative and on the relationship between the House of Commons and the Senate that would almost certainly arise. Unfortunately, based on the exchange between my friend Nick MacDonald and the Minister of State for Democratic Reform at the Canadian Study of Parliament Group’s event a few weeks ago (the same one where Paul Dewar dodged my constitutional question! ), I am not confident that the Harper government has fully considered the constitutional and conventional implications that this bill will entail. It is clearly designed as a stepping stone toward a formal constitutional amendment for an elective Senate (which I would support if it met my criteria contained in this blog), but I worry that in the meantime, this bill will complicate and strain the relationship between the two houses and turn the semi-elective Senate into a de facto confidence chamber. The legislation would in effect create two classes of senators, and those nominated after winning a provincial senatorial election would surely consider themselves more democratically legitimate than their colleagues who were appointed before the coming into force of this legislation. With democratic legitimacy comes the emboldened will to oppose legislation emanating from the House — and the Senate of Canada still, by the Constitution Act, 1867, may exercise all the same powers as the House (apart from the introduction of money bills) and could therefore block supply. The Senate isn’t likely to do so under the Harper government, but it might if the New Democrats ever form government, because that party does not officially recognize New Democrats as senators and favours the outright abolition of the Senate of Canada. The conventional implications of this bill could also result in deadlock between the two Houses to the extent that Canadians may oppose a properly elective upper chamber. The Harper government adopted the tactic of effectively amending the constitution without truly amending, or “opening”, it by adding the fixed-election date to the Canada Elections Act. It will adopt the same tactic with Bill C-7, The Senate Reform Act. I would argue that substantial, binding constitutional amendment that formally limits any part of crown prerogative – whether on the appointment of senators or judges, or the summoning, prorogation, or dissolution of parliament, or the prerogative of war and diplomacy, etc. – would fall under Section 41 (a) of the Constitution Act, 1982 (“the Office of the Queen, Governor General and Lieutenant Governor of a province”) and thus require the unanimous consent of the Parliament of Canada and all 10 legislative assemblies. Therefore, the only method of absolutely curtailing any aspect of crown prerogative involves codifying such restrictions in the written constitution, because the governor general makes these appointments (by constitutional convention only on the advice of the prime minister). As I explained in a previous post, that legislation implemented a novel, even paradoxical, concept: the use of codification that preserves the formal legal powers of crown prerogative as a means of forcing the creation of a new convention of how the prime minister should voluntarily restrict his application of crown prerogative. Section 52 of the Canada Elections Act establishes fixed-elections every fourth October, but codifies the current legal power of crown prorogation by inserting this phrase: “Nothing in this section affects the powers of the Governor General, including the power to dissolve Parliament at the Governor General’s discretion.” The legislation thus forces the creation of a new convention that the prime minister will restraint his use the crown prerogative to the confines of the act. This is precisely why the prime minister can, constitutionally and legally,still disregard the legislative provision. This is why a new convention, similar to that of the proper exercise of crown prerogative on dissolution and fixed-elections, would need to develop in order to reconcile the provincial senatorial elections contained in Bill C-7, The Senate Reform Act and its preservation of the prime minister’s crown prerogative to advise the governor general to make appointments to the senate, because upholding those provisions of the act are politically enforceable, not legally enforceable. The legislation would, in effect, suggest that the prime minister place voluntary limits on his crown prerogative such that he advises the governor general to appoint only those who won their respective provincial senatorial elections. However, the prime minister could still legally and constitutionally advise the governor general to appoint whomever he sees fit and disregard the results the provincial senatorial election. More than likely, the provisions of this bill would entail the creation of a new convention, and if a future prime minister broke with that convention and advised the governor general to appoint someone other than the winner of a provincial senatorial election, he would face grave political consequences. Now let’s turn to the Senate. This Bill C-7, An Act respecting the selection of senators and amending the Constitution Act, 1867 in respect of Senate term limits is in fact a constitutional amendment that the Government of Canada has tabled under Section 44. But some aspects of the Senate fall under Sections 41 and 42! The “powers of the Senate and the method of selecting Senators” and “the number of members by which a province is entitled to be represented in the Senate and the residence qualifications of Senators” fall under Section 42, the general amending formula. And the “Senate Floor Rule” (“the right of a province to a number of members in the House of Commons not less than the number of Senators by which the province is entitled to be represented”) falls under Section 41, the unanimity formula. Thus the Senate of Canada as a whole falls under three amending formulas, depending on how the amendment affects the Senate. Bill C-7 changes neither the powers of the Senate nor the number of senators from each province, so it does not fall under Section 42. And Bill C-7 also leaves the Senate Floor Rule intact, so it steers clear of Section 41 as well. The provisions of Bill C-7 apply to Section 44 — but not without political consequences. As I said in the introduction, I think that the two provisions contained in Bill C-7 fall under Section 44 in principle, but the current wording will pose some constitutional difficulties relating to crown prerogative and unwritten convention and to the relationship between the two Houses. I say “will pose” because the Conservatives hold majorities in both the House and the Senate, so this bill will surely pass, and because this bill will entrench in the written constitution the conundrum of crown prerogative and unwritten convention. And I say “difficulties” because anything that appears in the written constitution is obviously constitutional, even though different sections of the written constitution can come into conflict or generate political friction. I suggested a general outline for an elective Senate in a previous post, and I discussed the implications of an elective Senate on responsible government in another, and the proposals for Senate reform from 1867 to 1913 in yet another. But repetition is emphasis, as they say. In order to determine the true purpose of bicameralism, we should look to the former Legislative Councils in the Canadian provinces and the current Legislative Councils of the Australian states, since the “federal question” simply does not exist in the provincial legislatures or state parliaments (the Aussies do call their state assemblies “parliaments” as well). Clearly at the provincial or state level, the upper chamber functions as a house of review, or what we commonly call in Canada the chamber of “sober second thought.” They cannot possibly fulfill a federative function. Then this arrangement brings up the question of redundancy of the proponents of the appointive Senate: what is the purpose of two elective chambers? I would respond that two elective chambers that both elect their members on the basis of single-member plurality is indeed redundant. The old Legislative Council of the United Province of Canada (1856 to 1867) proves that point, and I would argue that the state senates in America continue to prove that point today. But since only the lower house determines which party or parties form government, the upper house can dispense entirely with these considerations of stability and government formation and focus on an electoral system that best secures its proper function as a house of review. Most of the Australian Legislative Councils are elected on the basis of proportionate representation, like the Senate of Australia, which normally results in a different partisan composition instead of merely doubling the scale of the constituencies and replicating the makeup of the lower house. Ultimately, I would prefer an elective Senate possessing powers similar to those of the current House of Lords so that it would act primarily as a house of review, but not as an obstruction and constitutional threat to responsible government, and certainly not as a house of the provinces. The proponents of the current appointive Senate raise valid concerns about the threat of deadlock between two elective chambers. That is why I support an elective senate limited, like the House of Lords, to a suspensive veto over money bills. The Australian Senate precipitated a significant constitutional crisis in 1975 precisely because it wields too much power over supply bills. The combination of an election, like the Australian Senate with powers limited to a suspensive veto and delay, like the British House of Lords, would result in a true house of review that could provide a healthy check on governments (which necessarily derive from the lower house) without becoming a de facto confidence chamber. This elective upper chamber would become a respected, measured, democratically legitimate addition to the Crown-in-Parliament without harming the principle of responsible government in the lower house. This entry was posted in Crown (Powers and Office), Prime Minister's Powers, Responsible Government, Senate Reform and tagged 7/50 Formula, Bert Brown, Canadian Study of Parliament Group, Legislative Council, s.41(a), Stanley Waters, The Dismissal of 1975. Bookmark the permalink. Good post! Given your reference to the House of Lords it’s interesting to see the differences in approach taken by the two governments to upper house reform. Both are attempting to elect the upper houses but have made motions about compromising on the details because of the politics. Stephen Harper has already published his bill and it’s had its second reading despite rumours of some Conservative Senators being distinctly unhappy about it (albeit with some discussion on a compromise for the term length). David Cameron’s pushed it into the long grass and is almost abdicating responsibility for the details with a joint committee scrutinising a draft bill with the government open to lots of changes. It won’t even be introduced until at least mid-2012. The responses are also quite revealing – the House of Lords has their own, more limited, bill on reform which it presumably wants to use as a bargaining chip whereas the Senate seems to be concerned more with altering (potentially even defeating?) the bill in front of them. I’m so glad that you mentioned the Cameron government’s draft bill on Lords reform because I’m going to write a little entry on that issue shortly as well! That bill would create a properly elected chamber, but I was amused to see that the draft bill insists that for the time being, this radically altered upper house would still cling to its current name. The concept of an “elected Lord” is an inherently contradiction in terms. But as you say, being a draft brill, it is subject to significant changes — or perhaps may never be formally tabled. I disagree with you that section 42 (specifically subsection 42(1)(b)) doesn’t apply. While the Senate Reform Act does not change the powers of the Senate, it certainly changes “the method of selecting Senators”. While the procedure at the federal level does not change, as the prime minister suggests that the governor general appoint someone to fill a Senate vacancy, the addition of the provincial election procedure would effectively make the Senate (partially) elected, thus changing the selection method. This is especially true if one applies that Upper House Reference to this matter, which prevents “Parliament…[from making] alterations which would affect the fundamental features, or essential characteristics, given to the Senate as a means of ensuring regional and provincial representation in the federal legislative process”. Even if Bill C-7 results in only a partially elected Senate, this would still affect the fundamental features and essential characteristics of the Senate, namely that it is not elected. I was going to address the Upper Chamber Reference in this post, but I decided against it because the SCC delivered the Upper Chamber Reference before patriation. I would therefore argue that the Upper Chamber Reference is of questionable value today. Bill C-7 does not change “the method of selection” because the governor general still appoints senators on the advice of the prime minister. The amendment of our Constitution is hard to understand not just because we have 5 amending formulas but because it’s so hard to determine which formula applies to a particular case. You argue that the current Senate reform bill, C-7, falls under section 44, amendment by Parliament alone. Patrick Baud disagrees, saying that paragraph 42(1)(b) is affected, which requires the 7/50 amendment formula. Only the Supreme Court of Canada (SCC) can say for sure. constitutions. Is the SCC were to say that–and Bill C-7 will be challenged all the way to the SCC after it’s enacted–then that part of the Senate Reform bill would be a nullity. The other part of Bill C-7 provides for a 9-year term for senators appointed after a specified date. I tend to agree with you that section 44 (amendment by Parliament alone) does allow Parliament to set a specific term for future senators. There are those, however, who argue convincingly that the Constitution Act, 1982, does not entirely cover all the fundamental characteristics of the Senate in sections 41 (Senate floor) and 42 (powers and method of selection), i.e. that there may be other features of the Senate that require 7/50 and can’t be amended under s. 44. Only the SCC can say whether their judgment in the Upper House Reference is still applicable in some respects. The major reason for thinking that Bill C-7 may be unconstitutional is, as Baud notes, the fact that it deals with the “method of selecting senators”. James Ross Hurley, in his book Amending Canada’s Constitution (1996), says at page 82, “An attempt to replace the fixed age for retirement with a fixed mandate of, let us say, ten years might constitute a change in the method of selecting senators”. Since Bill C-7 contains a part dealing with provincial election of Senate nominees, the SCC may well find that the pith and substance of Bill C-7 is to change the method of selecting senators. One final point about “selecting” senators. The Bill’s supporters keep saying it would not change the way senators are actually appointed (viz. by being summoned by the Governor General). But “selecting” is more than just “summoning” or “appointing”. The method of selecting senators may be changed even though they are still summoned by the GG on the advice of the Prime Minister. I disagree that the “selection of Senators” in the written constitution encompasses more than the prime ministerial nomination and the gubernatorial appointment. I suspect that the drafters choose that word “selection” in order to take into account the possibility that the Senators would one day be elected in a proper manner, which would surely required a formal constitutional amendment. This bill poses problems not so much for the selection of Senators but for the application of crown prerogative and the creation of new constitutional conventions on its use.